Certified Personal Trainer - ISSA Approved Referee - Associations of Boxing Commissions. CPR/ AED Certified - American Heart Association. Insured - up to $3 million for liability coverage. Ryan Spiteri is a professional fitness trainer and entrepreneur residing in the Metro Detroit Area. Through a series of self applied educational techniques obtained early on, Ryan has an indescribable optimistic outlook on his own personal life and passion for the health and fitness industry. Ryan became active within the fitness field at the age of 13. In an effort to increase his knowledge and continue the growth of his passion, he took on jobs working at various fitness clubs and supplement retail facilities. By age 19, Ryan secured his first official certification as a personal trainer. Ryan currently holds a certification via the International Sports Science Association (ISSA), with concentrations on bio-mechanics and physiology. Ryan also carries a certification in Kettlebell and TRX. Ryan is also an approved mixed martial arts referee credited by the Association of Boxing Commissions. He is a regular contributor to an assortment of local/national charity’s and maintains a strong involvement through his own Anti- Bullying Campaign as a motivational speaker/spokesman too positively impact young adults and children. Also on his list of accolades, Ryan is a certified minister, model and part time photographer. 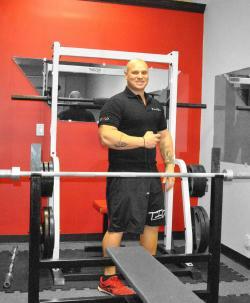 In 2007 Ryan remained persistent for success and founded the company Garage Muscle LLC. The overview of the company was developed through Ryan’s unorthodox training techniques and well structured fitness programs, all of which were available to his clients using his partially finished 2 car garage and the local high school field track. In an effort to generate new clientele, Ryan began sponsoring local professional/amateur mixed martial arts shows. Because of the level of popularity and the hundreds of thousands of fans and enthusiasts the sport was attracting at each venue, it was deemed a perfect marketing ground for potential prospects. However, the company was overwhelmed with positive feedback and intrigued the general population, offering apparel, accessories and supplements. Ryan became highly developed in 2011 when he launched his collection of casual/sport apparel and accessories brand, “Trained In Detroit”. among the sports entertainment industry. The brand is universally marketed towards all sports, athletes,fans and sports enthusiasts, with the intention of giving off a positive energy of dedication, loyalty, determination and other key characteristics for success. Trained In Detroit became a registered trademark of Garage Muscle LLC. in 2012 and Ryan is currently seeking licensing opportunities with local professional sports organizations, hoping to reverse the negative reputation imposed on Detroit’s iconic athletes.